ARIDO Fine Art jewelry created with the highest quality gems and precious metals in the world. Manhattan, NY, September 04, 2018 --(PR.com)-- The Venice Film Festival is the oldest film festival in the world. It is one of the "Big three” film festivals, alongside Cannes Film Festival and Toronto International Film Festival. Established in Venice Italy in 1932 the film festival is part of the Venice Biennale which was founded by the Venetian City Council in 1895. 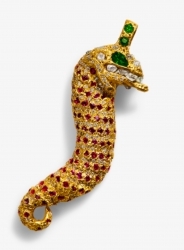 ARIDO, a closely guarded secret in the world's most exclusive art jewelry, founded by a scion of the Raphael family Jesse Raphael & celebrity guru Thomas Chappell, a world class designer. “APPLETINIES” world's most exquisite organic apple chocolate. The event will take place during Venice Film Festival in Venice September 5th, 2018.